It is quite common to switch from one running app to another by tapping on Alt + Tab buttons on Windows PC and if you wonder how you are able to do that quickly on your iPhone, then the simple tweak from BigBoss repo could be the right option for you. Named as LastApp, it enables users to switch between two apps quickly, making your usage on iOS devices much more effective than previous. Assuming that you have already jailbreak your iPhone, just head over to Cydia and under ‘Search’, key in ‘LastApp’ will list down the respective app ready for download. Download and install the app and wait for Springboard restart for completion. Once done, go to ‘Settings’ -> Activator settings -> In Application and you can pick whichever gesture or method you like to toggle the switching between two apps. For instance, users can choose to shake the device, double press Home button, short hold sleep button to toggle between current and last app depending on own preference. This is no doubt a great tweak especially when you always need to switch between two apps that you frequently used. 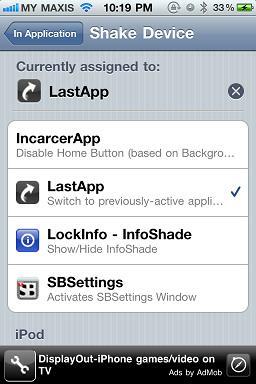 LastApp is currently available in Cydia (under BigBoss repo) for free download and do grab one and try it out yourself.